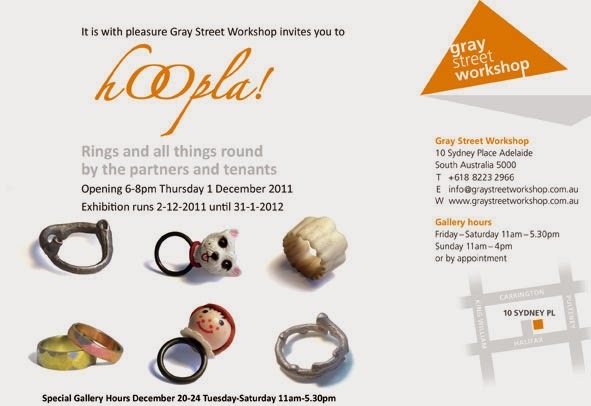 I was recently in Adelaide and had the chance to visit both the Jam Factory and Gray Street Workshop. I've read a lot about these two successful models for group studios, and it was great to see them in person. Catherine Truman was kind enough to show me around the Gray Street Workshop, a contemporary jewellery studio which has been running for 26 years, first at Gray Street and now for 17 years in its present location at 10 Sydney Place, Adelaide. Over 90 jewellers have been in residence at the Gray Street Workshop over the past quarter century, including Julie Blyfield, Lisa Walker, Assistant Professor of Jewellery and Metalsmithing at Indiana University (USA) Nicole Jacquard, and Kath Inglis, whose new work is on display currently at the Jam Factory. The workshop was founded by Catherine Truman, Anne Brennan, who left the partnership to begin a lecturing position at Canberra National University, and Sue Lorraine, now the creative director of the Metal Design Studio at the Jam Factory. Three partners, including newest addition lampworking artist Jess Dare, and six other tenants make up the Gray Street Workshop, located behind the new gallery. Grey Street Workshop's gallery space is celebrating its first year of operation. 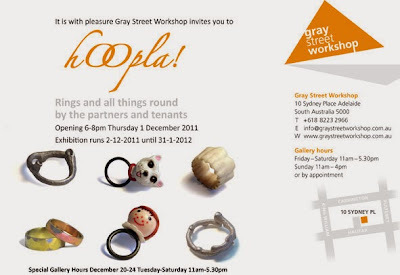 Hoopla, their Christmas exhibition themed around rings, was on display when I visited, featuring rings by all the Gray Street partners and tenants, and some interesting textile neckpieces by Lisa Funro. The exhibition runs until 31 January. I also had the opportunity to visit the Jam Factory centre for contemporary craft and design while in Adelaide. For almost forty years the Jam Factory has been promoting craft and design through its studios, galleries and shops. Housed in a spacious, contemporary building in Morphett Street, Adelaide, the purpose-built studios for metal design, ceramics, glass and furniture provide work spaces and training for Associates through a two-year program combining collaboration on manufacture of production work with development of individual directions and ideas.The Jam Factory also runs workshops, accepts commissions, develops lines of production work in collaboration with prominent craft artists, and has just opened an online store. When I visited, the main gallery was showing Generate 11, the annual exhibition of work by final-year Jam Factory Associates. The show features glass "monsters" by Andrea Fiebig, a hovering cloud-like glass installation by Kristel Britcher, and elegant ceramic homewares by James Edwards, as well as jewellery and furniture work. Showcasing both production work and one-off exhibition pieces, Generate 11 gives a good overview of what is involved in a Jam Factory Associate's training. The Collector Space Gallery is currently showing Bend, Stitch, Carve, an exhibition of jewellery by Kath Inglis, Tassia Joannides and Erin Keys. Kath Inglis' hand-dyed PVC "jewels" are enchanting, creating near-perfect replicas of themselves in shadows that appear like reflections. Generate 11 runs until 12 February; Bend, Stitch, Carve runs until 14 January.